How Much Does a New Roof Cost in Terre Haute? Posted on March 28, 2019 at 2:31 pm. Replacing a roof is one of the most important renovation projects you can take on as a home or business owner. While other updates may be primarily cosmetic, your home or business needs a good quality roof no matter what. If you’re like most people, when it’s time to plan for a new roof, you need to know what to expect, especially when it comes to price. How much does a new roof cost in Terre Haute? Read on to find out what plays a key role in the price, and how you can plan ahead for your next roofing project. There are many different factors that impact the cost of a new roof, from the materials used to the slope of the roof to the contractor, and that means final roof prices vary widely. Relying on average prices can be misleading, as they have nothing to do with your specific roof and could easily lead to sticker shock later. When it comes to roofing, knowledge is power. That’s why we’re here to walk you through some of the variables and help you know what to expect. Replacing an entire roof is a big project. 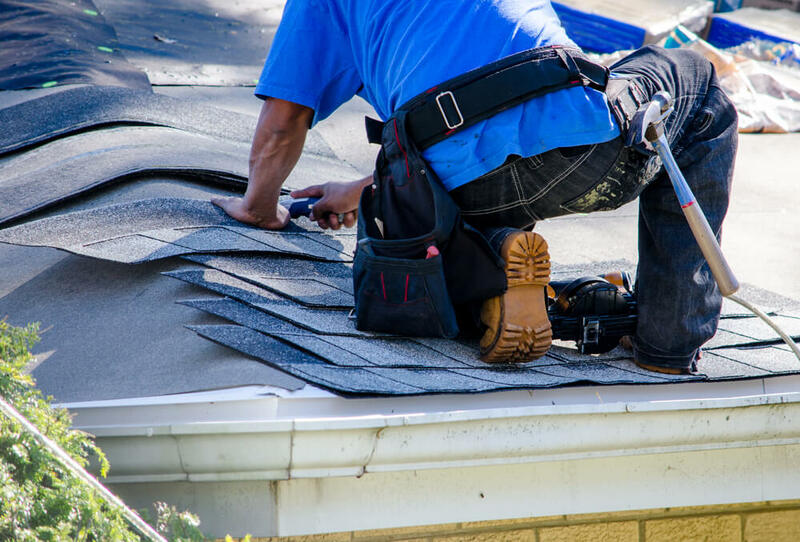 If you’re unsure if replacement is what your aging roof needs, you may want to check for signs of damage yourself or hire a professional roof inspector. When you’re ready to hire a roofing contractor, it may be a good idea to get quotes from several professionals, which will help give you a more accurate range. Look for companies that offer free estimates and are eager to earn your business. In general, materials make up approximately 40% of the price of any home improvement project, and a new roof is no different. Obviously some roofing materials cost more than others, and this is one area where you have a bit of control over what you spend. It’s important to know the size of your roof when calculating the price. Roofers and contractors typically charge for materials by 100 square foot sections, called roofing squares. A 2,200 square foot, two-story home will end up being about 17 roofing squares, but your roof may take more or less. When it comes to selecting your roofing material, you have plenty of options. You’ll want to make your selection based on aesthetic, functionality, and budget. Asphalt shingles are by far the most common, and least expensive, roofing material. They typically range from $120 to $400 per square. Wooden shingles run from $450 to $900 per square, while wood shakes (split from logs, shakes have been used in roofing for centuries) are $650 to $1,100 per square. Metal roof prices can vary widely, anywhere from $500 to $1,800 per square, depending on what you choose. Slate tile roofs range from $800 to $1,600 per square typically, but can get pricier. Clay tiles are yet another option, which average from $600 to $800 per square, while fancy custom made tiles can cost as much as $4,000 per roofing square. When choosing the right material for your roof, you’ll want to consider how long the roof is expected to last, and how it impacts the overall value of your home, as well as the price. The cheapest option might feel good for your wallet right now, while making an investment in your roofing project could save you more money in the long run. If materials make up roughly 40% of the price of your new roof, then the other 60% is labor, and that’s just as important. You want your new roof to last, and that means it needs to be installed properly by skilled professionals. Just like with any job, you get what you pay for. You’ll want to make sure your contractor is licensed, insured, and experienced in order to get the high quality work you and your home or business deserve. A good contractor will also offer some sort of guarantee of their services. For example, at Rogers Home Improvement, we offer a two-year workmanship guarantee on all of our roofing and home improvement projects. While you never want to skimp on labor costs, you should also be wary of any estimate too far outside of the average range. This is another reason it pays to get quotes from more than one professional, which will make it easier to spot an over-the-top price. While it’s important to pay for experience and know-how, remember that the highest price doesn’t always mean the best job. When you’re answering the question, how much does a new roof cost in Terre Haute, the pitch and shape of your roof also play a role. The more complicated the replacement is for the contractor, the more work it is, and that means a higher final price. A basic ranch-style roof is on the simpler end of things, and ends up generally being less expensive. A colonial is somewhere in the middle, with a few slopes to deal with but nothing too intense. The tudor style is generally the most expensive, because they tend to have many slopes, and the eaves can provide additional challenges. Any additional details, such as skylights and chimneys, will also impact the final cost. Things like gutter damage, mold, and winter damage can also drive up the price. Your contractor should do a walkabout of your home so they can point out problem areas to determine the most accurate quote before your project begins. That being said, if you haven’t kept up with maintenance of your roof, there’s always a chance that contractors may find a few surprises once they get started. Another cost to consider is removing your old roof, which is a vital part of the replacement process. Removing the old shingles is actually the hardest part of the job. And while in some cases new shingles can be laid over the existing roof, many contractors don’t recommend it because it may shorten the life of the new roof, which is something you probably don’t want. Ready to get serious about replacing your roof in Terre Haute or the greater Wabash Valley? Rogers Home Improvement is here to help. If your roofing or home improvement project isn’t in your budget for this year, we offer financing through EnerBank, America’s home improvement lender of choice. EnerBank offers low fixed interest rates that are locked in at the time of loan approval, and they don’t use your home as collateral, so there’s no lien on your property. They’ve helped nearly 700,000 homeowners get the financing they need to bring their home improvement dreams to life–including that new roof you need. Ready to get started on your new roofing project with a team you can trust? Backed by 25 years of community experience, we’re here to answer your questions as you start planning. Get in touch for your free estimate today.